Hey y'all! What happens when one woman decides it's time to change her life and make her dream come true and then takes all her friends along for the ride fixing their lives along the way? 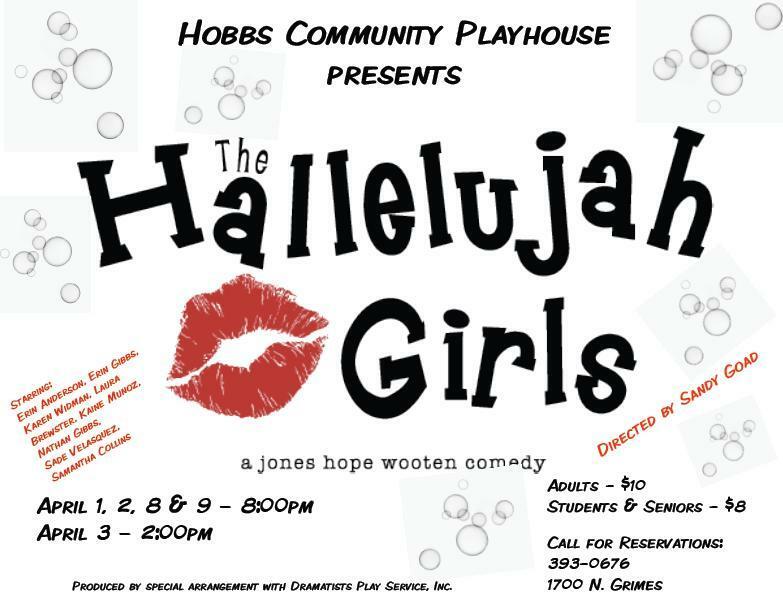 Well, to find out come see "Hallelujah Girls" which opens this Friday! This is a hysterical play that you won't want to miss. Performances are: April 1, 2, 8, and 9 at 8pm and April 3 at 2pm. Audition notice for "Beauty and the Beast"
"Beauty and the Beast" auditions will be held the 11th & 12th of April at the Maciolek School of Dance at 7pm. Singing and cold reading auditions will be held on the 11th with some possible singing and readings also on the 12th. You need to prepare a short song (16-32 measures of music will suffice). Bring sheet music in the appropriate key or a CD track of your song. The 12th will mostly be a dancing and movement audition (dress to move). SILLY GIRL(S) Three pretty young maids who swoon over Gaston. TOWNSPEOPLE Various ages, male and female. singing and non-singing. Can't wait to see everyone there! Spread the word! AACTFest Results...Hobbs takes third place!! "The Zoo Story" was chosen as the alternate to advance at the 2011 AACTFest! Los Alamos ("Moonlight and Magnolias") and Nat Gold Players of Las Vegas ("The Laramie Project") were selected to advance to the regional competition. Hobbs topped three other companies to be selected as alternate and placed 3rd overall in the competition. Congratulations to the director, cast, and crew! Coming soon...a trip to "SPA DEE DAH"
In need of a trip to the spa? The ladies of "SPA DEE DAH" will hook you right up. 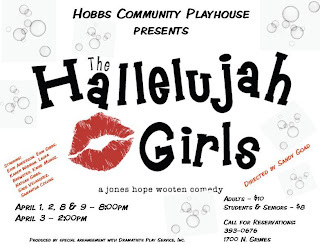 Shows are April 1st, 2nd, 8th, and 9th at 8 PM and a matinee showing on April 3rd at 2 PM. "The Zoo Story" has finished it's run...or has it? One more chance to see the show in Artesia, NM! If you missed "The Zoo Story"...you missed one terrific show. However...you do have one more chance...next Saturday, March 12th at 7:30 PM at the Ocotillo Performing Arts Center in Artesia, NM. The shows at the AACTFest are open to the public, tickets are $7 per show (or $30 for a ticket for all 6 shows). 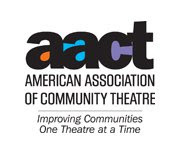 See http://www.theatrenm.org for details of the AACTFest and show dates/times for all participating entries. What are audiences saying about "The Zoo Story"? Come see "The Zoo Story", tonight at 8 PM at the Playhouse! "The Zoo Story" opens tonight at 8 PM. This is the Playhouse's entry in the 2011 AACTFest in Artesia, NM. This is the state level of the American Association of Community Theater's binnial theatre competition. Shows selected to advance from Artesia will compete in Lewisville, TX, and could ultimately compete in the national competition in Rochester, NY. The Hobbs performances will consist of two monologues, one performed by Briana Schneider and one by Brad Jett, followed by "The Zoo Story". "The Zoo Story" is the story of Peter and Jerry (played by Robert Schumacher and Nick Keele, as seen above). The show deals with themes of connection and isolation and how these two ideas come into conflict with each other. This show is intended for mature audiences and is not appropriate for children. Shows are Thursday, Friday, and Saturday (March 3rd, 4th, and 5th) at 8 PM. Call 575-393-0676 or email for reservations. Tickets are $10 for general admission and $8 for students/seniors. Proceeds go to benefit the cast and crew as they travel to Artesia for the competition. Tune in to "The Morning Ride" with Russ Black on 95.7 KPER tomorrow morning around 8:30 AM to hear Nathan R. Miles, Nick Keele, and Robert Schumacher talk about "The Zoo Story" and the AACTFest competition. Yes, just two days left. "The Zoo Story" opens March 3rd, 2011, at 8 PM. Additional shows are on March 4th and 5th, also at 8 PM. Tickets are $10 (general admission) and $8 (seniors/students), and proceeds go to funding "Team Zoo Story" for their trip to the competition in Artesia. "The Zoo Story" is directed by Nathan R. Miles, and stars Nick Keele ("Jerry") and Robert Schumacher ("Peter"). "The Zoo Story" is intended for mature audiences and is NOT suitable for children.